More than 38 million Americans age 40 and older are blind, visually impaired, or have an age-related eye disease, and adult vision loss costs our economy more than $51 billion a year. With major advances in vision research bringing new prevention and treatments, it is critical that support for research and incentives for innovation remain a priority. 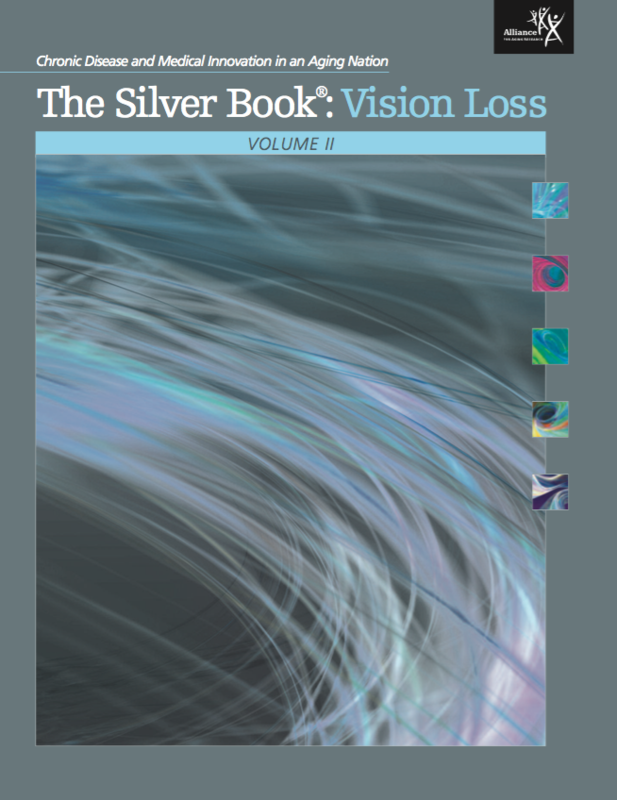 In order to highlight this important data and encourage conversations and policies that look to investments in innovation rather than short-term cost-cutting and health care rationing, the Alliance for Aging Research has teamed up with the Alliance for Eye and Vision Research (AEVR) during their Decade of Vision, to release Volume II of The Silver Book®:Vision Loss. Volume II brings updated data on age-related macular degeneration (AMD), diabetic retinopathy, and glaucoma—which along with cataract, are the eye diseases that disproportionately impact older Americans. This new volume also highlights the exciting changes and discoveries in vision research and treatment from the past 5 years.